Ever felt you were removed from familiar, comfortable environs, confronted suddenly with a thronging Babel that gives you a sense of vertigo? In his 1970 novel, Epepe (published in English translation in 2008 as Metropole), Hungarian writer Ferenc Karinthy (son of the famous Hungarian humorist Frigyes Karinthy) plumbs the depths of despair, longing, and desire that can occur when a familiar touchstone (in this case, intelligible language) is suddenly removed from us. What would we do in Budai’s place? Would we manage to cope even half as well as he does when he is unable to converse with anyone in this strange city in which he has suddenly found (and lost) himself? Several times Karinthy’s narrator refers to “hordes,” or to the masses of people who move through the nameless, foreign city. Are these masses benign or is there something driving them? By this time, simple explanations or metaphors have to be eschewed. The confusion, the true babbling sense of the other people around Budai, these find their echo in the larger, more violent outpouring of the latter stages of the novel. One cannot these two elements; each is a reflection of the other. Overlaying this is a sense of irreality, where this might possibly be a very unsettling dream, although one (and Budai) certainly fears it will prove to be otherwise. Metropole’s unnerving atmosphere defies easy categorizations. Its narrative can rattle unwary readers who are not prepared for the twists contained within the story. When the story “ends,” one might wonder if one is “escaping” or merely going into the next stage. 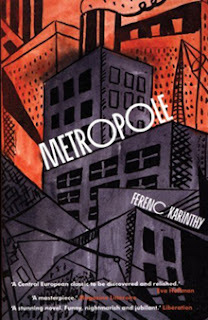 Metropole certainly is a tale that cannot be forgotten easily, as it lingers in the subconscious, spawning dreams in its wake. Highly recommended.